As I was making this tart for Shauna's Gluten Free Thanksgiving Baking Round Up, I started reflecting on how much I enjoyed being an expat in America around the holidays. I now have an entire second family, a tight group of friends and handful of added occasions to celebrate new traditions and holidays such as Halloween, Thanksgiving, etc... Even Christmas in B's family is light years away from mine. Starting with the food of course. I did not grow up around pumpkin pie, pecan pie or double crusted apple pie but like anyone entering another family, expat or not, there are new traditions I have come to love. Some I have been privileged to make my in-laws discover as they let me bring my own creations to their tables. One of these dishes was my grandmother's Tarte Fine Aux Pommes. She was famous for it. And for good reason. One of the simplest and yet most aromatic and satisfying thin crusted pie I have ever had. She'd start by making a very basic applesauce with heirloom and very tart apples, a bit of cardamom, and lemon. She'd then layer it at the bottom of a very thin pate brisee crust and top the tart with thin slices of fresh apples. It was thin on all counts, rustic and absolutely amazing. The textures, fragrances. That bit of crunch from the crust, the oozing applesauce underneath and the pretty slices of apples on top. A feast for all senses. When Shauna sent out an email to put together a massive round up of gluten free baking recipes for Thanksgiving, my head started spinning. Wow! Thanksgiving was indeed so close and I felt like I was already one train wagon behind! But it is indeed necessary to start such a big round up filled with so many options for baked treats for the holidays. Whether you are gluten free or need to bake gluten free for someone coming to break bread at your table, that round up provides you with so many delectable options. Go check it out on Shauna's blog. It's awesome. And tempting. And delicious. Did you see the giveaway going there on her blog? Pretty cool, non?! Guess what?...Shauna is graciously giving one copy of their book to one of you guys! Whether you like stories, recipes, tips, challenges, there is something for everyone. There is love to share. 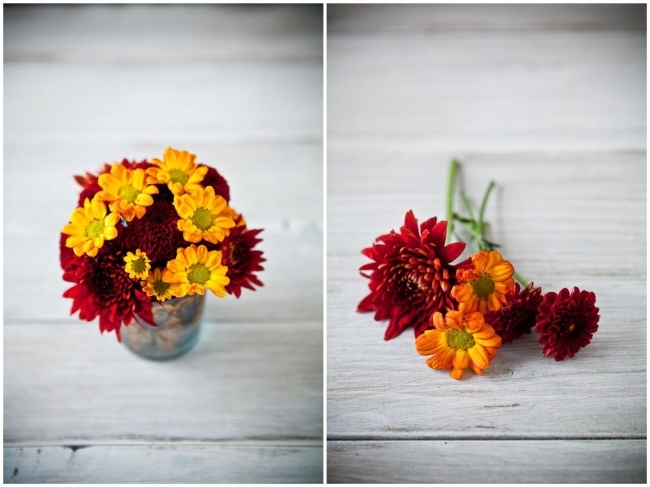 Beautiful words, delicious recipes and inspired photography by Lara Ferrroni. A feast for the senses! All you have to do is leave a comment on this post between now and Sunday November 21st at midnight Easter time, when my better half will draw a winner at random. No anonymous comment, sign an initial, X or a name so I know you are not a robot! One entry per person. Good luck! Forelle Pear Tart - Tarte Fine Aux Poires - Adapted from "Asian Pear Tart" in Gluten Free Girl & The Chef. Notes: I am writing down the recipe as Shauna and Danny wrote it for their book and adding my changes as I go along. The only reason behind my substituting flours was due to our personal preferences and what I have on hand in the pantry. Sift together the millet flour, corn flour, potato starch and sweet rice flour into a large bowl. Add the sugar, cinnamon if using and salt. Sift into another bowl (I admit I skipped that part). Grate the frozen butter directly into the dry ingredients with a medium cheese grater. Work with your fingertips until the dough feels like cornmeal or large pieces of sand. In a small bowl, whisk the egg and the water together with a fork. Make a well in the center of the flour mixture. Add the liquid, and start gathering the dough together with your hands or a fork. Gather the dough into a ball and refrigerate for at least one hour or overnight. Butter and flour an 11-inch tart shell (I used 2 rectangular pie shells). Pull the dough from the refrigerator and let it come to room temperature a little. Roll the dough between 2 pieces of parchment paper to the approximate size of your tart pan. If the dough tears a little, just piece it back together with your fingertips. Freeze the tart dough for about 30 minutes. While the dough is freezing, preheat the oven to 375F. Place a piece of parchment paper on top of the dough, fill with dry beans and blind bake for 15 minutes. Let cool. Core and peel the pears and toss them with the honey and cardamom (or vanilla bean and sugar if using). Spread the apricot jam evenly at the bottom of the pie shell and layer the pear slices on top. Bake for 30 to 40 minutes or until golden brown. Let cool and serve with whipped cream if desired. What a fabulous giveaway; I would love to win Shauna's book...she is amazing! Thank you for your great giveaway and have a wonderful Thanksgiving. That pear tart looks delicious! OOo what a beautiful tart! And I also would love to win Shauna's Book.. love her blog as well.. keep up the good work! Thanks! but i think i'll also be doing some baking soon...because everything looks delicious! I'm so inspired by your beautiful tart! Can't wait for the weekend so I can get baking! I love Thanksgiving! I think I have more pies than people coming over. Oh well, that just means leftovers! i love that more bloggers are experimenting w. gluten-free recipes, baking especially. thanks for the inspiration. our thanksgiving tradition calls for apple and pumpkin pie, but this tart looks good enough to tempt me to start a new tradition! That tart looks scrumptious! And the book does too! That tart looks so yummy!! Now see this is what I'm talking! When people with allergies. intolerances, or whatever like myself see delicious foods like this we no longer start to feel without. Food just looks delicious! That tart looks awesome! So delightful. I love your recipes and photography! Thanks for sharing, between this and the crepe recipe I am going to be busy in the kitchen this week! Not sure I can find persimmons around here though. As always, gorgeous post. I have the cookbook and love it. Still working hard at gluten free cooking and baking. Helen, you are the best photographer and cook. I want to be like you and Shauna. I will have to try this crust, I am trying to reduce gluten from my diet. A stunning tart and tribute to Shauna's work. Always a sucker for pie-type things that include fruit and jams. Such a beautiful tart! Love the thin crust. Your tart looks amazing, but then your photos always look so stunning. I love that you published Shauna and Danny's original recipe and then added your own substitutions next to it. Like reading inheriting a relative's old worn cookbook, and opening it up and see how that relative had crossed out things and marked up the pages with their own ingredients. It shows how a recipe is a living document. The Gluten Free Thanksgiving roundup has just been amazing. So many beautiful posts! I'm pleased to have been a part of it. Wow, that tart is making my mouth water! While I do like pies, I LOVE tarts. I've been thinking of making a tart for Thanksgiving this year, rather than the traditional pumpkin, pecan, or apple pie. Or maybe I can just make both! I may just have to save this recipe for next week.. 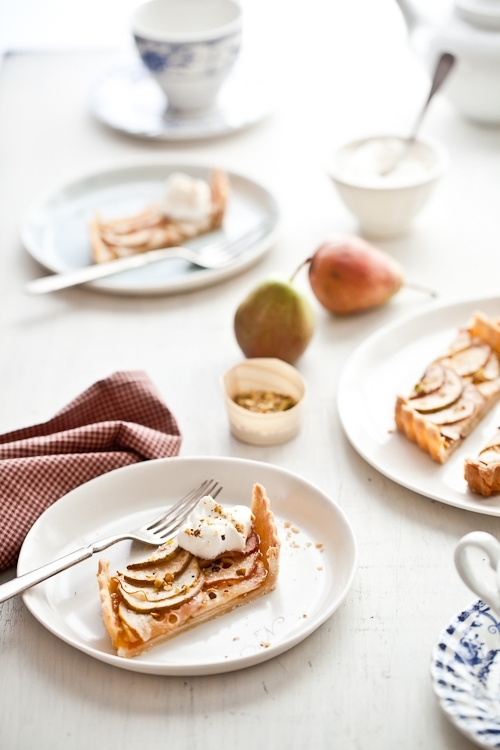 I will make the pear tart this weekend. It looks wonderful. What a yummy sounding tart! Gorgeous tart! Pear desserts are always so delicious! Yum! That Tart looks AMAZING....I am dealing with gestational diabetes...yeah, Holidays...Sweets? Not happening this year...but I would love the cookbook because once this baby is here I will be cooking/baking up a storm again! Thanks! This GF thanksgiving series makes me so teary. It's my first Thanksgiving gluten free and it is definitely a challenge in not feeling left out. Thanks for this beautiful recipe and the giveaway! Ooooh! Pick me! Pick me! I would so love this book and it's not in any of the stores in Canada that I have looked....this would be wonderful! goodness, that tart is lovely! What a beautiful tart for autumn.... and the pictures are very refreshing and gorgeous as always.... i have loved following each and everyone of your posts! The tart looks delicious! I'm in the midst of planning my own gluten-free Thanksgiving, and appreciate GF recipes that are simple and tasty. Thanks! Pears are a great sub for apples. Sometimes apples get a little too much love, and pears deserve some too. :) Loving the jam in there as well. Beautiful! You've made someone who doesn't enjoy pears want to try this. I've never celebrated Thanksgiving until I come to America. Now I have something to make for potluck! Thanks for the beautiful post. Great giveaway! Love the tart, looks beautiful! The pear tart looks beautiful and delicious. Happy Thanksgiving! Mmmm. I'll have to try this tart this Holiday season for my grandma, who has recently discovered she can't eat anything with wheat (and probably gluten). I've also looked at Forelle pears lately and not yet tried them! I love pears! Thank you! I love pears, what a great substitute for apples! Another nice recipe. Since we are talking about Thanksgiving I want to thank you for the awesome macarons tutorial, my family goes crazy anytime I made those. I love pears. This looks delicious. Thanks for the giveaway opportunity. Your tart is just beautiful! I bet it was delicious too! Thanks for the fun chance to win the giveaway! This is wonderful! And I'll have to give this recipe a try. Beautiful (as always) Happy Thanksgiving! oh this looks simply divine and I agree about the traditions of different families and welcoming others into your own traditions - sharing is all that this time of year is about! Love the giveaway and am definitely going to make this tart! This may need a spot on our Thanksgiving dessert table. It looks scrumptious. This looks so good. Your photos make everything look extra delicious. I'll have to try this one. I'm sure it's as yummy as it looks. The pear tart looks lovely! I am still loving your blog and recipes! Thanks for the lovely and delicious inspiration! I can't wait to try this recipe. My mom recently developed a gluten intolerance. We're both pretty picky about our baked goods and it's been especially hard to find pies and tarts that don't feel like a poor cousin of the full-gluten thing. I think we have a winner here! 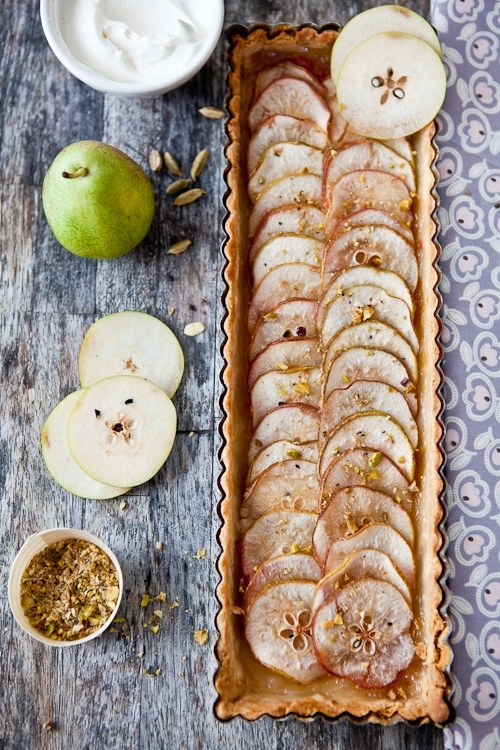 Love pears and this tart looks so lovely - the book sounds FAB! Lovely photos as ever. I have been meaning to try out some gluten free cooking and would love that cookbook. I would love a copy of this book to give to my friend who is gluten free for health reasons. Thanks. While I don't have to eat gluten-free your recipes are enticing and look scrumptious. Thanks for doing this latest giveaway! With now 2 good friends having to go gluten free... it will definitely come in handy. I'd definitely love to win the book! I keep hearing so much about it- it sounds lovely. It is funny how posts like this don't make me hungry, but make me anxious to go and work, cook, bake. I try to bake gluten free for my friend with celiacs as often as I can. Having a cookbook for it would be awesome. Yum... i recently made an apple tart that was delicious! Ooh now I know what to do with the tiny Forelle pears my mom brought home from Costco :) Thanks! 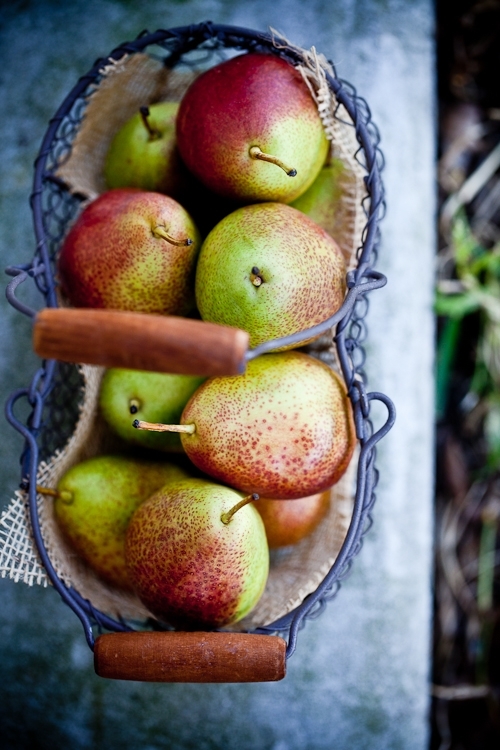 Those pears are just gorgeous! And the tart is mouthwatering. 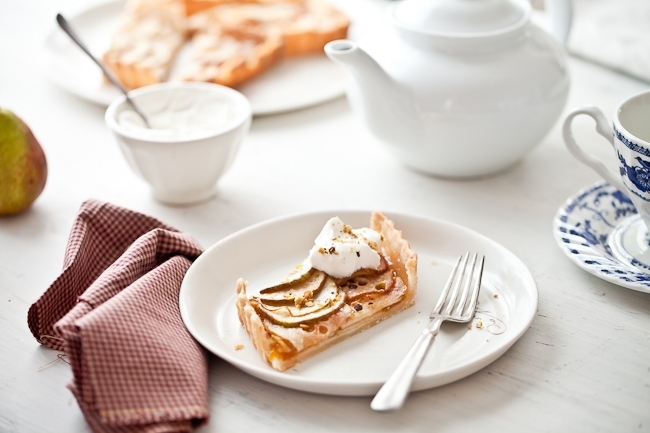 Gorgeous tart - I love how you sliced the pears! I must confess that I have never heard of Forelle pears, but I will look for them now. Thank you for the opportunity to win this book - it looks lovely!! it looks wonderful. i can't wait to make it for tea! This recipe looks scrumptious! I love your photography as well! Oh I love pears! This recipe is truly a gift in itself. Thank you XOXO. AS a person new to GF baking and being a diabetic I would adore having a book that can help me get my health in better control. Thank you for a chance at wining this too. I have spent last saturday doing your Cinnamons. First of all I had to convert all the measures in gramms and I don´t know what happen but the dry yeast was not that efficient as I though. Maybe a incorrect translation! Anyway, I think I´m giving a new try. Wish me luck. 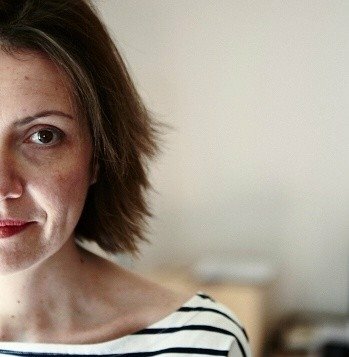 I follow your Blog since few months and I find your photos and recipes really good. Thank you. I don't know what I'm more excited about--the giveaway, the tart, or the photography--you've left me open-jawed, as always! Nuna: maybe it's not the conversion: what was the expiration date on the yeast? Was your liquid at the right temperature? Being too hot or too cold could really do harm in the end. I am glad I am going grocery shopping after checking your post. It looks delicious. Thanks for another gluten free recipe. I am not a robot... or i sure hope i am not. I am simply just another admirer/follower of your wonderful blog that absolutely envy's your lighting in each of your photos, as well as the way you frame your compositions. I'd also have no objection to winning that wonderful book! THE PIE LOOKS AMAZING, AS DOES THE DISH!!!! Apple cakes, pies, tarts etc. have to be a favorite in my family. Lovely pictures as always! What a deliciously sounding and beautifully presented dessert! I think it might just replace the traditional pumpkin pie on my table this Thanksgiving!! Autumn is my favourite part of the year....all these apple pies I can finally eat in season....your recipe looks delicious !! The tart and the pictures all look so amazing! Your grandma's tart looks fantastic. I'm glad you included instructions for her original version as well as the apricot and pear variation. I did a little gluten free baking about a year ago when I thought I had celiac's disease. My blood tests came back negative and I took a break from being strictly gluten free. I also have Crohn's disease and have been really sick for the past couple of years. I think now would be a good time to start eating gluten free again and see if I can cut out some of my nasty symptoms. I like the way you cut the pears into slices. It's very pretty. I've been craving for a 'tarte fine' aux pommes so I'll be trying your recipe. thank you! Beautiful post as always! Love the second to last shot with the pears on top of the tart in full glory. Thanks for posting! and btw, you have a pretty blog! Your tart looks delicious, I will have to try it. This looks incredible. My mother is allergic to gluten and lactose and people sometimes ask what on earth she can eat. I feel like showing them this post and saying 'swap the butter for a dairy free alternative and she could eat that'. Crispy, crunchy, sweet and delicious! Powerful pears, looks good! That tarte looks so good! I recently bought that tart pan and used it for the first time the other day. It works better than a standard pie tin for gluten free baking. I'll have to try this recipe for sure! Yea!!! Thanks for the chance to win!! The cookbook sounds great! With so many recipes for pumpkin, as well as apples, at this time of the year, this is a light refreshing dessert to serve - with tea or as dessert - thank you! That looks so yummy and as a wheat-intolerant girl, I love when things are delicious and ok for me to eat at the same time! This looks like an elegant dessert. Pears make ideal tarts. yum! your tart looks delicious! Those pears have the most amazing skin. They almost look like avocados. I'm a big fan of hers (even though I am not gluten free) and I know her book must be wonderful. This tart has a dainty prettiness to it. Thanks for the inspiration. The photos are amazing, so beautiful. And the recipe looks very delicious. The pear tart looks fabulous. That tart looks yummy!! Nice pics again! Great giveaway! The tart looks soooo good!! Hi Helen! I'm sooo glad you went GF because I love your recipes. Put me in the drawing please. Huge props to you on the new book deal too- can't wait for your giveaway next year!! I bet this is an amazing book!! Andrea from NC: thanks! It's been a while though! This tart is so gorgeous I can't get over it!!! And I'm sure it's delicious as well! Beautiful photos and recipes as always! And great contest. I would love to win Shauna's book as I'm learning to bake GF for a family member. Thanks for a chance to win the cookbook! I love your blog and although I have only tried a handful of the recipes, I always love looking at the photos and handy tips! lovely photos as always! :-) i would looove to win the book! put my name in the hat--it looks like a lovely book! so beautiful and original ideas ! Thank you ! I have also been playing with many different approaches to GF pie crust and this recipe is very close to what I found works best - complete with the changes you made! So fun to see everyone's experiments. Wow, that tart looks incredible! Great idea to use the pears for it too! Well, I know what I'm doing with our extra pears now :) Yum! That looks wonderful :) I have never been able to figure out a thin crust for my tarts. Will have to give this one a try! This would be so good for my sister! Your tart looks amazing!!! As usual, your photos are beautiful!! !Would love to win Shauna's book. Thanks for the giveaway!!! love the look of the thin pastry! the photos are drool-worthy. now i've just got to make that tart. I love your photography....everything always looks soooo delicious!! Your blog is always so inspiring. I just made an extra thin apple galette using a combo of your grandma's apple sauce and thin apples as inspiration. Thank you for sharing. The pear tart sounds and looks delicious. Would love to win the book! Gorgeous food photography! I need to make that Apple Tart.. Looks delish! I love your pictures, they make everything look so good! Wow! Shauna's book looks like a true, culinary treat! My family, who is gluten free would love to gather round, and give thanks for the knowledge and creativity put into a book of gluten free recipes that keep on giving! Your entries are so inspiring. I want to start documenting the food I invent and eat, just for my own sake if not others. Thanks for giving such wonderful ideas. I cannot wait to try your pear tart!!!! wow :-) thank you for this opportunity. Great recipe! Please count me in for the competition! I would love to get my hands on this cookbook! the book looks very nice :)thanks for a giveaway! Mmm.... this tart sounds delicious, as does the book. I am a huge fan of your blog. You inspire me to be more creative in my own baking and photography. Thank you! Your work is amazing! I hope I win :)! I think I just might make that gorgeous tart for Thanksgiving! This is absolutely gorgeous Helene! The tart looks simply divine. Yum! Cela semble si délicieuse! J'adore vos recettes! I would love to experiment in gluten free cooking! Thank you for the gluten free Thanksgiving ideas and for promoting "Gluten Free Girl & The Chef." I am new to gluten free cooking(out of necessity) and would love to win a copy of the cookbook. What a lovely tart. I adore pears. Your grandmother's pie sounds superb. I have several friends who have gluten free diets and I would love to cook for them. What a lovely tart! Thank you for sharing it and an opportunity to win a book!